New Children’s Librarian Katherine Palencia said landing the position at the Library is a dream come true for her. When new Children’s Librarian Katherine Palencia sits at her desk in the basement of the Chelsea Public Library near the Children’s Rooms, it’s a place that has been familiar to her since she was a little girl – coming to the library with her mother and experiencing a safe, learning environment. Now she has been hired as the new full-time librarian after having worked part-time at the library for about 10 years, and is excited to share her love of reading with a new generation of Chelsea kids. Palencia attended St. Rose School as a girl, and then went to the Williams Middle School. She attended Chelsea High School and graduated in 2007. She graduated from Salem State and is currently pursuing a Master’s Degree in Library Science at Cambridge College. Palencia said her memories of the Chelsea Library are very comforting, and she hopes to be able to pass that on. Palencia has been spearheading the English as a Second Language program that meets on Wednesdays at 6:30 p.m., and now she has expanded that to working in the Children’s area. She said her big push right now is for the upcoming Summer Reading Program. She said they will be bringing back the story times soon, and will have a full range of winter and spring activities soon as well. 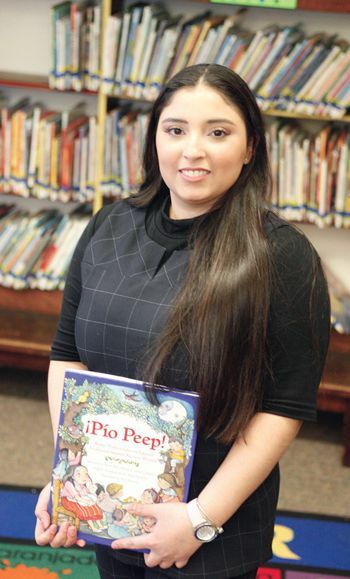 Cutline – New Children’s Librarian Katherine Palencia said landing the position at the Library is a dream come true for her. Having fond memories of attending the library as a girl, she said she is excited to pass that on to a new generation of Chelsea kids.